As we head into the New Year, it’s the traditional time to think about healthy and nutritious eating – and, here in Sussex, there can be few better places to start than Tuppenny Barn. Based from their beautiful smallholding in Southbourne, West Sussex, they grow a vast selection of organic fruit and veg – ranging from heritage apples, tomatoes and peppers to specialist squashes and some 30 different salad leaves – that is then sold fresh from the field in their onsite farm shop. “We’ve even been known to pop down to the field to pick something while the customer waits!” laughs founder and CEO of Tuppenny Barn, Maggie Haynes. “To complement all the fruit and veg, we also sell our own home-made jams and chutneys, and honey from our hives, as well as a lovely range of fresh cakes, bakes and pastries. Then there’s the organic eggs from Rookery Farm, in Bognor Regis, which come from happy, free-range hens. Whilst the farm shop is certainly one of the highlights of Tuppenny Barn, there is actually a much wider story to this fascinating enterprise. 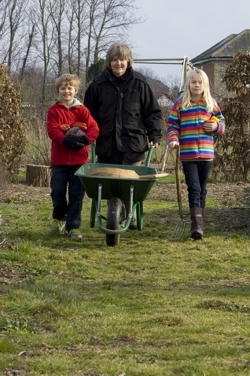 A registered charity, they also run a whole range of innovative community projects – ranging from learning experiences for schoolchildren, who are taught about every aspect of the field-to-fork process, to horticultural therapy for vulnerable adults. They even run courses in old-fashioned countryside skills such as foraging, wreath-making and willow weaving. Indeed, as well as the foodie aspect to all their work, the farm has recently branched out into the area of sustainable fashion, with special catwalk shows featuring local ethical brands, such as Earth Monk in West Wittering, and second-hand clothing. They also host a monthly ‘swap-rail’, in conjunction with Transition Chichester, where members of the community can come and exchange unwanted clothes for free. In fact, in another nice local link, any surplus coats and jackets from the events are then donated to the Four Streets project, which helps homeless people in Chichester. Looking ahead, they have plenty more exciting plans in the pipeline too. Having recently received a Heritage Lottery Grant to improve their orchard, where they grow a wide variety of heritage apples, that will be a big project for this year – and they will also be doing two charity openings for the National Garden Scheme. The main focus, however, will continue to be the many schoolchildren that come to visit them. Sussex-based Tuppenny Barn prides itself on its farm shop and organic veg box deliveries, but it is also steadily garnering a reputation as an education hub for children that promotes the benefits of sustainable and organic food. The beautiful barn is also the perfect place for community events, meetings, art exhibitions and activities such as yoga.